Jonathan Pollard was a civilian American Naval intelligence analyst. His history of how he became an intelligence analyst is interesting can be found here. In 1983-1984, Pollard discovered that information vital to Israel's security was being deliberately withheld by certain elements within the U.S. national security establishment. Indeed it was the case that Israel was legally entitled to this vital security information according to a 1983 Memorandum of Understanding between the two countries. The information being withheld from Israel included Syrian, Iraqi, Libyan and Iranian nuclear, chemical, and biological warfare capabilities - being developed for use against Israel. It also included information on ballistic missile development by these countries and information on planned terrorist attacks against Israeli civilian targets. When Pollard discovered this suppression of information and asked his superiors about it, he was told to mind his own business, and that Jews get nervous talking about poison gas; they don't need to know. He also learned that the objective of cutting off the flow of information to Israel was to severely curtail Israel's ability to act independently in defense of her own interests. Pollard was painfully aware that Israeli lives were being put in jeopardy as a result of this undeclared intelligence embargo. He did everything he possibly could to stop this covert policy and to have the legal flow of information to Israel restored. When his efforts met no success, he began to give the information to Israel directly. The story of his capture has been told very clearly . He and his wife have created a website with his side of the story . Our purpose here is to bring out in Torah codes one part of the Pollard story that is perhaps least written about: the relationship between Jonathan Pollard and Rabbi Mordechai Eliyahu. When Jonathan was arrested in 1985, HaRav Mordechai Eliyahu was already the Chief Rabbi of Israel for two years. Anne Pollard, Jonathan Pollard's former wife, writes that when the spy case broke with all of its attendant hysteria and hyperbole, Rabbi Eliyahu ignored the slander and smear and took a more insightful look at the events. The Rav felt certain that there had to be enormous messirut nefesh (selfless devotion to the Jewish people) that lay behind what Jonathan had done for Am Yisrael. He determined that he must meet Jonathan face to face to investigate further. During the years until Rabbi Eliyahu's death (June 7,2010), Rabbi Eliyahu maintained close contact with Anne Pollard and visited Jonathan Pollard in prison on most of his visits to the US. Rabbi Eliyahu held that Jonathan's release is also the key to the release of all of Israel's captives and MIAs. Once Jonathan is out, all the captives are all out! Once they are all out, we are all in Redemption! In the same way that Joseph's name became Yehoseph, Joseph with an additional ה, Rabbi Eliyahu wanted for Jonathan Pollard to change his name from Jonathan, יונתן, to Yehonatan, יהונתן, with an additional ה. And indeed in Rabbi Eliyahu's study, Jonathan was referred to as Yehonatan. For us the interesting part of this story is that Rabbi Eliyahu always referred to Jonathan as Joseph the Tzaddik of our generation, יוסף הצדיק של דרנו. Just as biblical Joseph was wrongly imprisoned for 12 years, so was Jonathan Pollard wrongly imprisoned. When biblical Joseph was let out of prison, he became the most important person in Egypt after the Pharaoh. 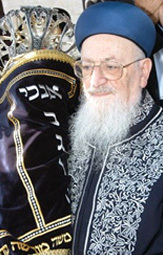 Rabbi Eliyahu's son is Rabbi Shmuel Eliyahu and is the chief rabbi of Safed. Rabbi Shmuel Eliyahu has called Jonathan Pollard the Tsaddik who is the foundation of the world. Because of this story, it was natural to look for ELSs of the key words Jonathan, J. Pollard, prisoner, jail, and Joseph to see if they all came together in a compact table. What is surprising is that they do. And the verses running through the last two rows of the table are indeed from the story of Joseph and his imprisonment. This is a table showing the most compact meeting of the terms relating Jonathan Pollard to biblical Joseph. With expected number of ELSs set to 10, the probability of a monkey text from the ELS random placement monkey text population having as a compact table of all the ELSs shown is less than 1/100,000. The table spans the verses from Genesis Chapter 36 verse 21 through Genesis Chapter 39 verse 22.